Founded in 2005, The French Piano Academy offers an innovative way to learning Classical and Jazz Piano. With the use of foreign instructors and textbooks imported from Europe, we deliver a "total immersion" experience for students of all ages. 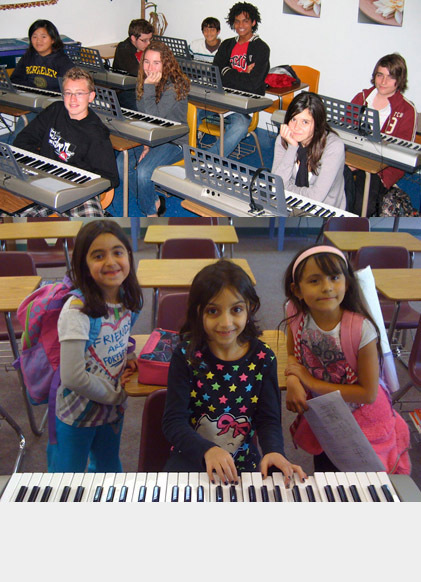 With a single lesson a week, your children or yourself will develop strong Piano chops with an emphasis on sight reading and solfege as well as a strong basis in music theory. Each School year concludes with a gala concert where our pupils have the opportunity of demonstrating the progresses accumulated so far... and win over stage fright as well! I *Love* Piano (3 Levels | ideally suited to Children Age 3 1/2 -> 5). With Music Awakening, students will learn the basics of music with a mixture of French and U.S. Material. Basic Piano songs to be played in class by the end of Level 1. I *Love* Piano, our flagship class in preschool environment, is a complete immersion into French Conservatory curriculum with the use of French teaching methods and textbooks. In conjunction with French Solfège studies, Piano practice takes place as early as week 1. Private Classes: Age 6+, Teenagers, Adults; Group Classes on Campus. We also provide private classes for Children Age 6 and more [teenagers and adults private classes available upon request] + group classes for children starting age 10 [based on school eligibility]. 1019 California Ave. Santa Monica, CA 90403. 1067 S Fairfax Ave, Los Angeles, CA 90019.